Icelandic design studio Flétta turns disused trophies into totemic tables and lighting, in an attempt to restore junked items to their former glory. Called Trophy, the series features an eclectic mix of second-hand trophies that have been stacked on top of one another with glass surfaces for the tables and light bulbs for the pendant lamps. Presented at Design March, which took place in Reykjavík between 28 and 31 March, the project aims to transform neglected trophies into sculptural objects that can be used in the home. "These objects that once had great value to someone are now almost worthless," said designers Birta Rós Brynjólfsdóttir and Hrefna Sigurðardóttir, who head the design studio. "We found it sad that these objects, which were made for one big moment, seemed to lose all their value. We wanted to see if we could give the trophies a new value," they explained. "Also for people like us, who have never won a trophy, it was tempting to get our hands on some!" they continued. The duo searched for second-hand trophies at flea markets and charity shops. They also contacted sports clubs in and around Reykjavík, which sent the designers some of their disused trophies. "When people started hearing about the project, individuals began stopping by our studio to give us trophies they had won, which were collecting dust in their garages," said the duo. "Suddenly, we had an overload of trophies in our small studio." Once they had gathered a sufficient number of trophies, the designers began to disassemble the objects into their individual parts. "We were fascinated by all the shapes and materials the trophy consists of, such as marble, gold-plated plastic and metal," they said. These were then rearranged and stacked on top of one another. Glass surfaces were added for the tables and light bulbs and electric wiring for the lighting. The pieces were then secured using nuts and bolts that were left over from the deconstructed trophies. "We're building up shapes, colour and materials into sculptural objects. 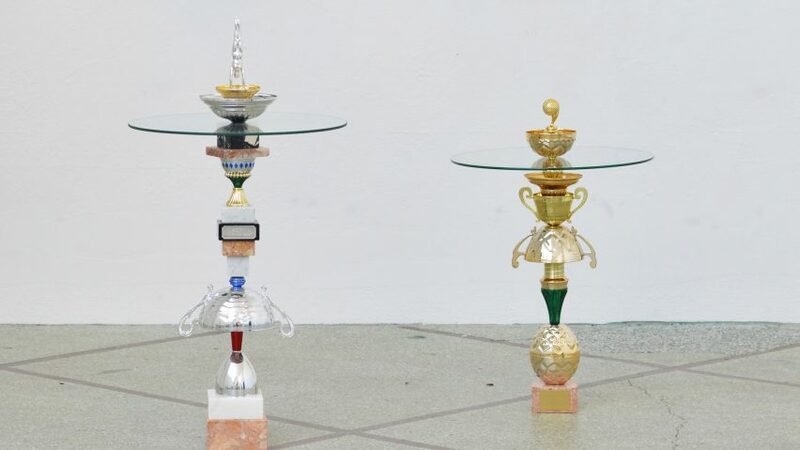 We try to use only the parts that come from the trophies and we only add new materials to add functionality to the objects like glass for tables or light-bulb for lamps," said the duo. Last year's offerings at Design March included a furniture piece made of volcanic rock found in Iceland's landscape and a series of cleaning tools and products made from pine needles and horse fat.